Amazing classic dessert. 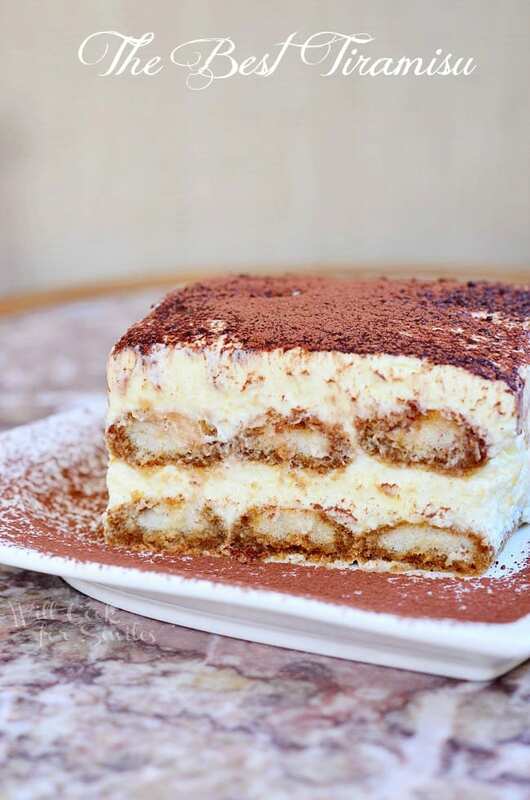 Tiramisu is made with layers of espresso dipped Ladyfingers cookies, smooth mascarpone cream with a hint of Amaretto and dusted with cocoa powder. 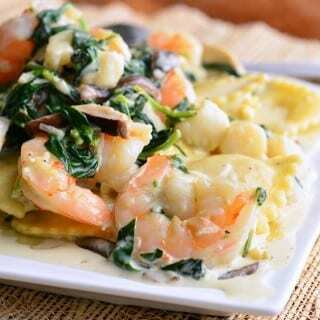 This recipe uses eggs that have been cooked to safe temperature. 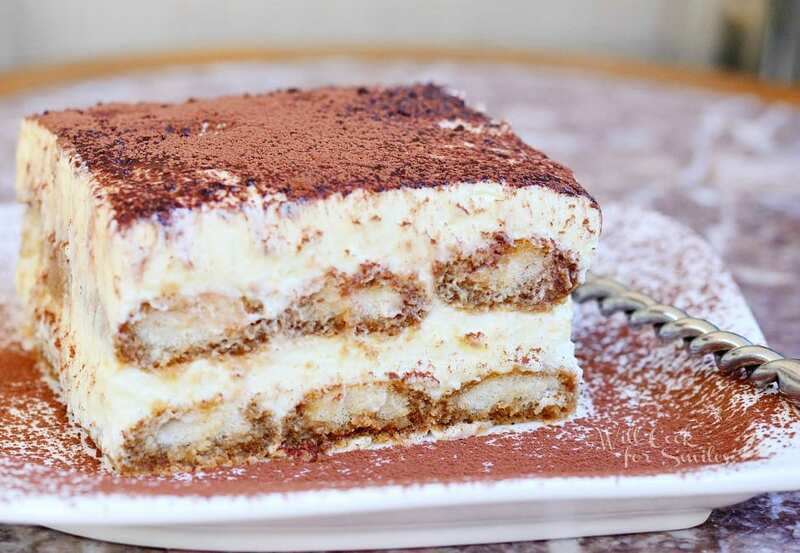 Tiramisu is a special dessert for me. I tried it for the first time when I moved to the states. This was one of the best desserts on the menu of our family restaurant. My mom was always the one to make the desserts and she insisted that I try her Tiramisu first. I Loved it at first bite! I watched her make Tiramisu for years but was always intimidated to make it myself. The finished product always looked like it took forever to make. Boy, was I wrong. This dessert is super easy to make and takes about 30 minutes. The longest part is letting it set in the refrigerator for a few hours. If you have an immersion blender, then you won’t have to break out your hand mixer or stand-up mixer and it will be that much easier. You can use the whisk attachment for whipped cream, for beating the eggs and beating in mascarpone cheese. There is nothing in the tiramisu not to love. Italian Lady Finger cookies are soaked in strong coffee and layered with smooth cream. If that’s not enough, the dessert is infused with Amaretto liqueur and topped with cocoa. Many people get concerned about Tiramisu using beaten raw egg yolks mixed with mascarpone and whipped cream, but my recipe, I bring egg yolks to safe temperature in a double boiler. There is small risk in using raw eggs and that is why I prefer to cook the eggs in desserts like custard and tiramisu. I bring the eggs to a recommended safe temperature of 160°F. Heat up water in a double boiler over medium heat and lower heat to medium-low. Add egg yolks and 1/2 cup of sugar and gently whisk to mix. Cook yolks and sugar in the double boiler over medium-low heat, slowly stirring the whole time, for 7-10 minutes. (Until eggs are 160-165 F.) Make sure to keep gently stirring to keep eggs moving the whole time so it doesn’t harden. Take off heat. 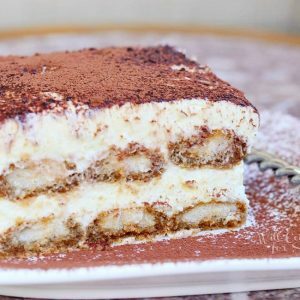 CAN I MAKE THIS TIRAMISU WITHOUT ALCOHOL? 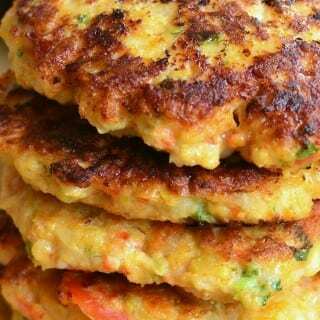 Yes, this recipe can be made without alcohol. There is such a small amount of Amaretto in this recipe that you can simple omit it without compromising the texture of the cream. So if you do not wish to include alcohol in your Tiramisu, simply don’t add it to the eggs. 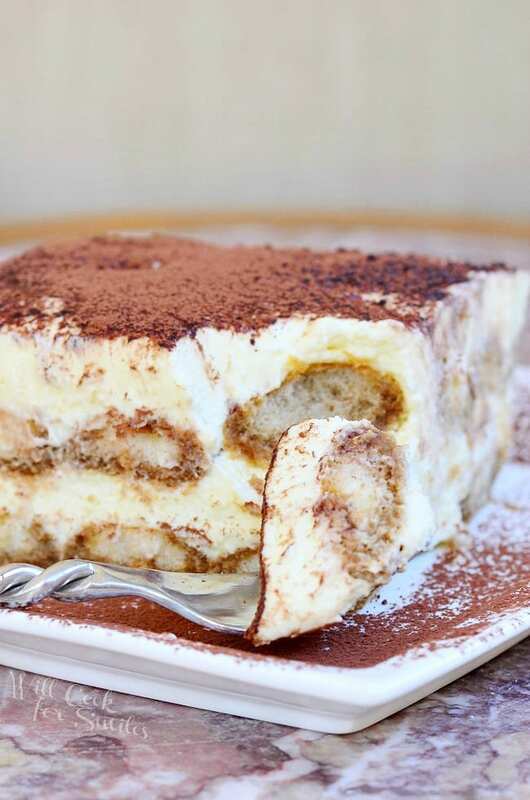 Tiramisu is easily stored in the same dish it is made in, in the refrigerator. Make sure to cover the dish with plastic wrap to create an air-tight seal over the top. 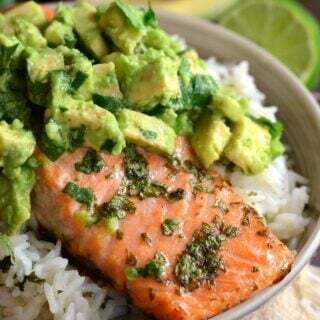 If the dish you are using comes with a lid, that will be perfect to use. Store Tiramisu in the refrigerator for 4-5 days. 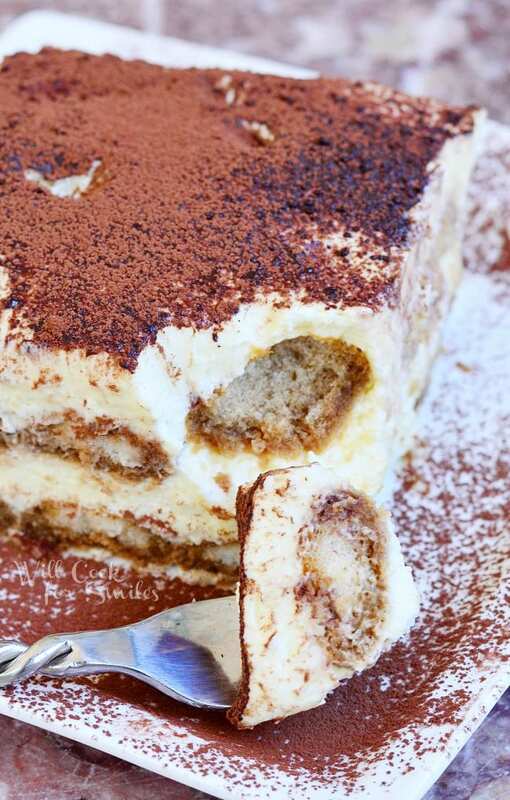 You can also make Tiramisu ahead of time. Prepare Tiramisu completely and cover the pan air-tight. 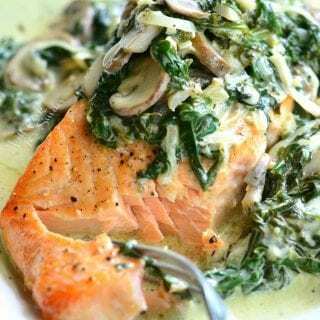 Keep it in the refrigerator for a 1-2 days before servings. Make sure to refrigerate all leftovers immediately. 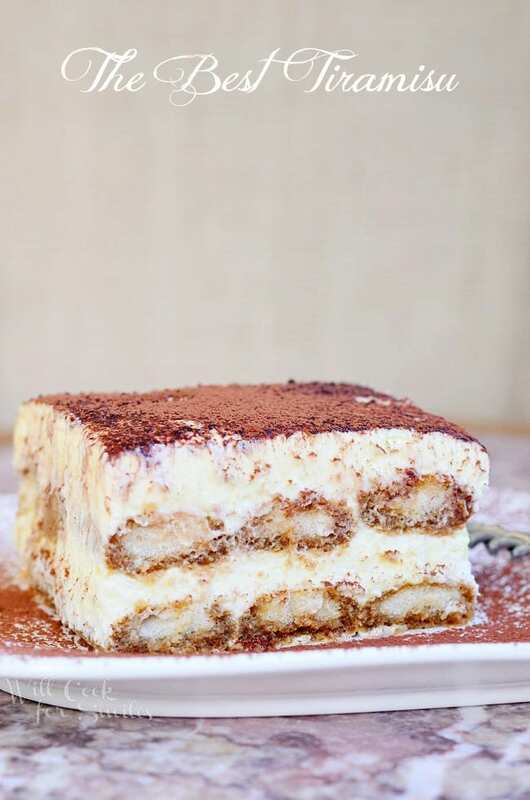 Tiramisu is made with layers of espresso dipped Ladyfingers cookies, smooth mascarpone cream with a hint of Amaretto and dusted with cocoa powder. Heat up water in a double boiler over medium heat and lower heat to medium-low. Add egg yolks and 1/2 cup of sugar and gently whisk to mix. 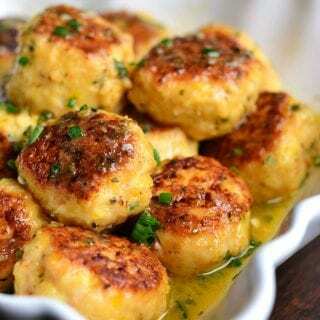 Cook yolks and sugar in the double boiler over medium-low heat, slowly stirring the whole time, for 7-10 minutes. (Until eggs are 160°-165° F.) Take off heat. Add Amaretto and, using a whisk attachment, beat egg yolks until thickened and light in color. Beat in mascarpone until combined. Carefully, fold in whipped cream until all smooth. Use an 8x8 baking dish to put together Tiramisu. Pour cold espresso into a bowl that will fit the lady finger cookies. Slowly dip each cookie in cold espresso but don't soak them. Lay dipped cookie in the corner of the dish. Repeat with each cookie, laying dipped cookies side by side until the bowl bottom of the dish is covered. Cover cookie layer with half of mascarpone cream mixture, making sure it even all over. Layer remaining espresso dipped cookies over the cream and cover with remaining mascarpone cream. Originally published on Will Cook For Smiles on February 22, 2015. This looks so perfect! I love all the flavors and ingredients in it. Thanks for the encouragement to try it! Awe, thank you! I do hope you try it! All it took was the word Tiramisu and I started salivating. 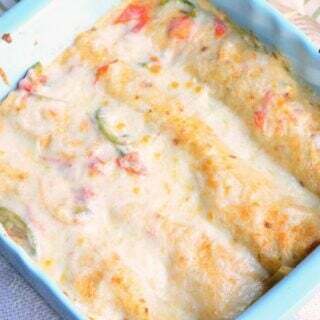 Your recipe looks marvelous and I am looking forward to making it for my family. I’ve made tiramisu in the past but I like the way your recipe comes together. By the way, you’re changing your camera settings — I find the pictures much lighter. They are as excellent as your tiramisu. I actually took this photo at my mom’s house and not at home, I think that’s why this photo looks a little different.